Yesterday afternoon was a delightful day, warmish and sunny, and proved a good time to improve a fire break we will use for a spring burn. Experience has shown that making fire breaks in the fall is always a good idea. We used both a brush cutter and chain saw. All of the cut stems/stumps were treated with Garlon 4. The fire break we worked on is in the woods on the north side of Toby's Prairie. This is an area where there was a big aspen clone that we girdled and removed in the late 1990s. These aspen had moved into what had been a white/red oak woods, and when we removed the aspen we left the oaks. 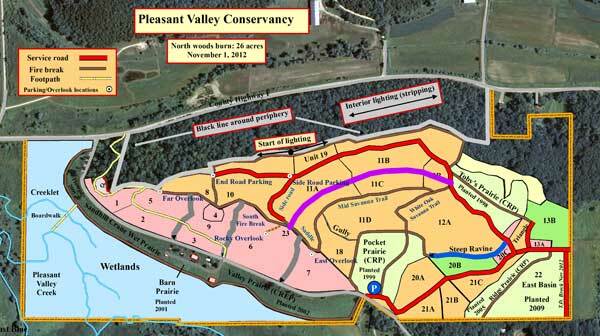 Since this area is adjacent to a prairie, it made sense to burn both the woods and prairie at the same time. However, for the past several years the burn crew has managed to burn only the prairie, and the site was starting to fill up with brush. This next spring, and from now on, we will be burning both the prairie and woods together. As the second photo shows, we are running the fire break just above a point where there is a sharp change in topography. Historically, the field that is now Toby's Prairie was plowed just to this point (as shown with GIS by the 1937 air photo). That was back in the days when horses were used to plow. Post World-War II, when a tractor became available, it was no longer possible to plow so far down the hill. (Tractors tend to get stuck in the mud in these north-facing areas.) Left alone, it gradually filled in with oaks, some of which are now quite large. The aspen clone came later, moving out of the former plowed field and down the hill. 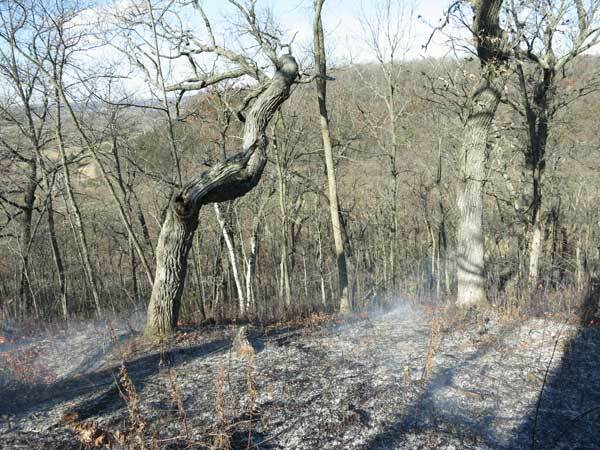 We aren't burning in order to turn this area into a prairie or savanna, but we do want to control the brush (hazel, willow, gray dogwood) which is invading in a major way. As can be seen by the photos, there are plenty of oak leaves to provide fuel. In the spring, all we will need to do is make a quick pass along this fire break with a leaf blower and it should be ready to go. On Tuesday Susan, Amanda, and Kathie made the seed mixes for our fall/spring prairie and savanna planting. We aren't planting a major area so we don't need a lot of seed, but the total still came to 120 pounds, and there were 130 species. Our principal use of seeds this year is for bare areas where significant amounts of invasive plants were killed and for areas that are somewhat impoverished. Experience has shown that enriching areas with more species is almost always a good thing. Although the best time to plant is in the late fall/early winter (now), the areas to be planted must be bare so that the seeds get to the soil. Ideally, this should be after a burn. Since most of our burns will be done early next spring, most of our planting won't be until then. Therefore the seed mixes will be stored in protected areas outdoors. I discussed the details of making seed mixes in a blog post last year, so I don't need to repeat it. Here is a link. Despite many cautions to the contrary, it is possible to spray weeds this time of year. In fact, it is an ideal time to use glyphosate, because lots of exotic weeds have an extensive fall regrowth period and are still green. Since most of the native plants have senesced and are brown, they will not be affected. Here is some research from Ohio: Mark Frey et al. "Cold weather application of glyphosate for garlic mustard (Alliaria petiolata) control. Weed Technology 2007, Vol. 21, pp. 656-660. Although I haven't seen any research on it, it should also be possible to spray exotic cool season grasses such as smooth brome and bluegrass. Also reed canary grass. Again, foliar glyphosate. In fact, this is a great time of year to spray these bad grasses because all the native grasses have senesced. The rule is that only plants that are green will be affected. If it isn't green, it won't be hurt. And there is no soil residual with glyphosate. Yesterday, we sprayed lots of patches of cool season grasses. In addition to those mentioned above, we also sprayed large clumps of orchard grass. Here is what I think happens when you use glyphosate this time of year: It is absorbed by the green leaves and is translocated to the roots, where it remains in an active state all winter. When the soil warms up in the spring, the herbicide takes over and kills the roots, thus killing the whole plant. Mark some sprayed areas and see what happens to them in the spring! Why burn a prairie this time of year? Yesterday we burned the 3-acre Crane Prairie. This long, narrow prairie is sandwiched between our wetland and the large south-slope prairie remnant. 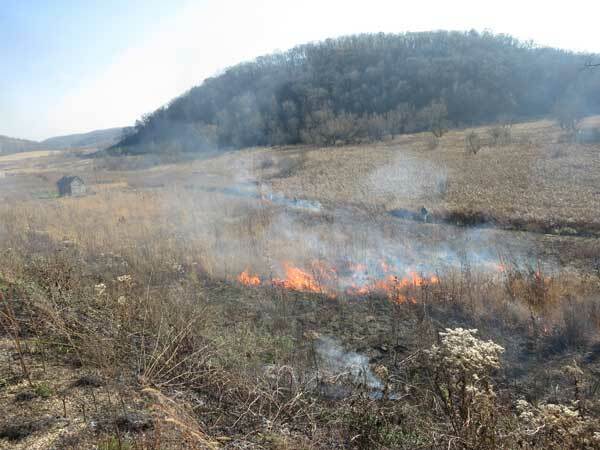 We needed a wind from the south to keep the fire out of the wetland and a large enough crew so that we could keep the south slope prairie from burning. Fortunately, one of our contractors, Michler/Brown, was nearby doing another burn and came over to help us. The Crane Prairie is a long strip of wet mesic prairie right next to our large wetland (partially seen in the background). 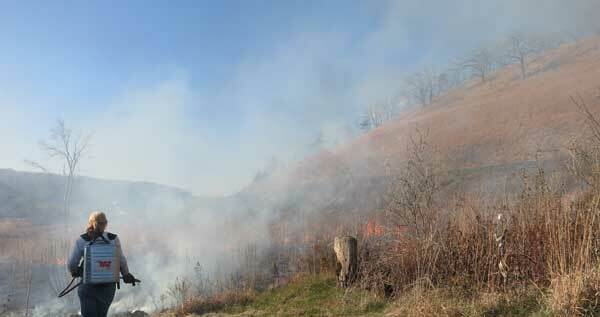 With a south wind blowing away from the wetland, we had no trouble keeping the fire under control. We monitored the large prairie on the south-facing slope for spot fires using Pleasant Valley Road as a base. The burn took about an hour to complete and we had no trouble with spot fires. We burned this prairie in the fall because we wanted to spray resprouts of undesirable species in the early spring. 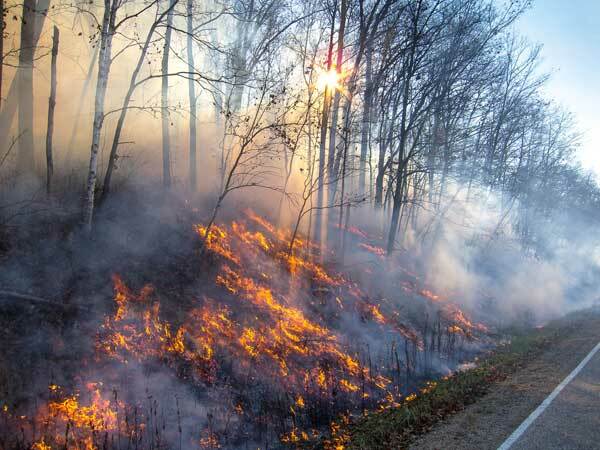 Burning in the fall is good because all vegetation has died back so that it is unaffected by the burn. 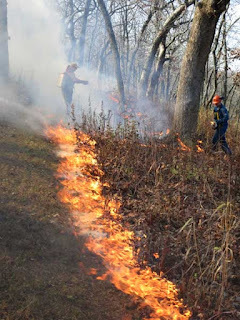 If one burns in the spring, early species have generally already started to grow and are set back by the burn. The main problem with a fall prairie burn is that a lot of the vegetation is still green and does not burn well. Also, since this is a wet mesic prairie, ground water is close to the surface. However, the Crane Prairie (which had just finished its 7th growing season) has lots of Indian grass, which is the best fuel for a prairie burn. By burning in the fall we can monitor the prairie in early spring and start foliar spraying as soon as bad plants are visible.What species are we spraying? Anything undesirable. Brambles and pale Indian plantain (a clonal species that is especially difficult to control). Also, reed canary grass, burdock, Canada thistle, and Canada goldenrod, all of which appear early. The weather finally cooperated, a good crew was available, and on Thursday, Nov. 1, 2012, we were able to accomplish the planned burn on our north-facing woods. 26 acres of mixed oak woods. Kathie's estimate on the day after the burn was over 90% burn coverage, which is the best we have ever been able to do. Next to a skilled crew, the most important thing for a successful burn is the right weather, and we had it. 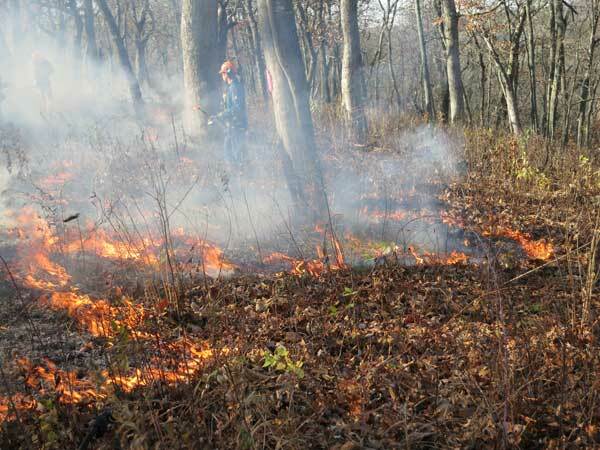 We have a biennial schedule for the north-facing oak woods and this was the year to burn. Because of the drought, all the leaves of the big oaks were down; there was plenty of fuel. The major rainfall in late October, however, complicated matters, but finally at the end of October the weather cleared. Between the sun and wind, the fuel (oak leaves) dried off, although heavy dew slowed things down and on the day of the burn we waited until noon to get started. We had a skilled crew. In addition to our own crew (Susan and Amanda) and an experienced volunteer (Michael) we had personnel from both Integrated Restoration and Michler/Brown. The map shows the burn procedure. Click here to download a higher resolution (PDF) version. We had constructed a fire break around the whole periphery, starting at the hilltop with the North Fire Break. A mowed/blown break went from there down the hill to County F at both ends. Lighting (with two crews) began in the middle at the top (see "Start of lighting" on the map). One crew went east, the other west, following the fire break at the top of the hill. Because of the wind, this was a backing fire across the top of the hill. Several "waters" spread out following each drip torch, keeping an eye out for spot fires. It took each crew about an hour to reach their end of the North Fire Break, and another hour to reach the bottom of the hill at County F.
The fire spreading out from the North Fire Break. Once the whole woods was ringed, interior lighting (stripping) could be started. The northwest wind and the steep hill resulted in a head fire, but because the principal fuel was oak leaves, flame heights were not high. We also lighted the County F road cut, which has a lot of great savanna herbs (see Michael's photo below). By 3:30 PM the whole woods was burning and attention was then turned to mop-up at the sides and top of the hill. A few tall snags near the top of the hill presented problems, and chain saws had to be brought in. 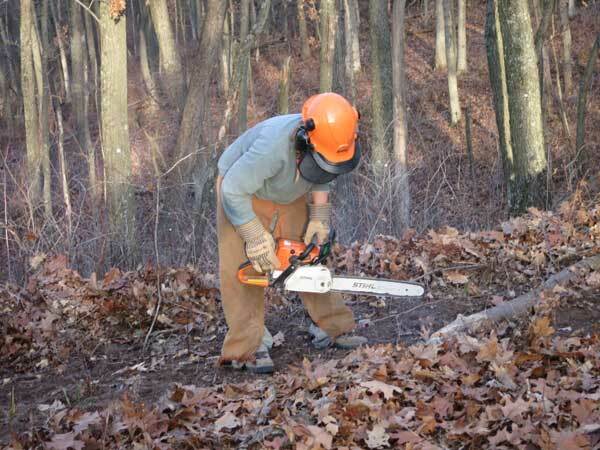 (You don't start an oak woodland burn without a couple of chain saws ready.) Everything had been wrapped up by 5 PM. Next day Kathie and I came back to survey the results. By this time all the smokers had gone out. There is a middle footpath that extends the whole length of the north woods and Kathie used that for access. From that mid point she could look both up and down and assess the extent of burn coverage, which was at least 90%, perhaps more. White oaks rising out of ashes at the east end of the burn unit. Close up of the burn. Most of the fuel was oak leaves. A very successful burn, the best we have ever had on the north woods. The principal fuel, oak leaves, is newly fallen and very flammable. In the spring, especially in a big snow year, the leaves are flattened, soaked with water, and thus burn poorer. Snow is not a problem in the fall. In the spring, especially in a large snow year, the snow may remain even into April, thus preventing a burn. 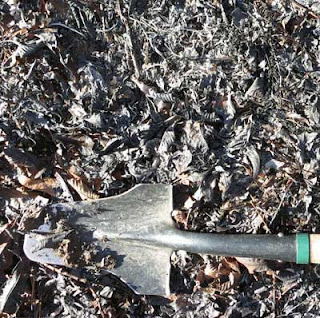 Once the snow does melt, it may take quite a while for the oak leaves to dry out enough to burn well. In fall all the native vegetation has senesced and will not be affected by the burn. In the spring, many early species will have already developed and will be knocked back by the burn. With poor timing, a year of development may be lost. However, the fall burn season is generally very short, and if you aren't paying attention you could miss it completely. 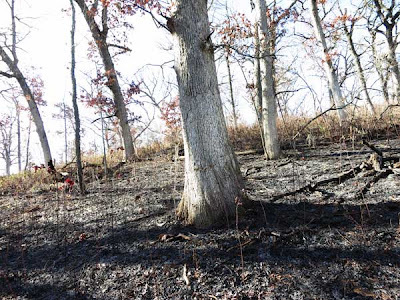 For north-facing oak woods, it is thus best to try for a fall burn. If you miss it, you still have the spring ahead of you. Burning a wide black line at the top of the hill. 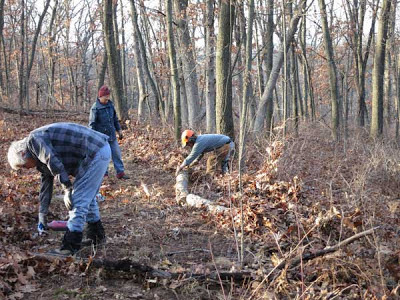 This is important to protect the oak savanna areas.